The banking industry has warned customers with online accounts to guard against a new wave of cyber fraud. Industry body Apacs said some 2,000 British online account holders had been taken in by scams in the past year, losing £4.5m between them. Many were duped into revealing their account passwords by phoney e-mails purporting to come from their bank. 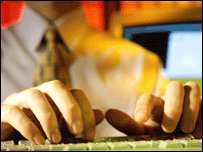 Others had their computers infected with programs which allow fraudsters to record their log-in details. Apacs is launching a website, banksafeonline.org.uk, which tells online account holders how to protect themselves. The organisation said account holders should treat all unsolicited e-mails with caution, and should make sure that their computers are fitted with the latest anti-virus software. About a quarter of them have no updated virus checker on their computers, while more than 40% do not have an active firewall, the poll showed. "The new website will hopefully encourage anyone who hasn't thought about protecting themselves before to start doing so now," said Apacs spokeswoman Sandra Quinn. Ms Quinn stressed that online bank fraud remained far less widespread than credit card fraud, which has affected one in three of all British cardholders. The phoney e-mail scams, known as "phishing," were first reported in the UK in September 2003, and reached a peak in May and June this year. There has since been an increase in the number of cases where account holders' computers become infected with malicious viruses, dubbed "Trojan" attacks. Online bank fraud is usually perpetrated by organised crime groups, often based in eastern Europe and the former Soviet Union, according to the National High-Tech Crime Unit (NHTCU), a police body formed in 2001 to tackle cyber crime. The proceeds of the scam are typically transferred to British accounts held by local accomplices, who then wire the money overseas in exchange for a commission. In May, police arrested 12 people in London and the south-east on suspicion of acting as intermediaries for fraud gangs based in eastern Europe. Detective Inspector Mick Randall of the NHTCU said close cooperation between British police and their counterparts in several European countries had recently resulted in a number of "significant" arrests in Russia.